Cornelia Josephine Mitchell was born on 31 December 1834 in Montgomery County, Alabama, or 1835. She was known as Josie. James L. Mitchell and Elizabeth H. Douglass appeared in the US federal census of 1 June 1850 in Vernon, Autauga County, Alabama. Other members of the household included Cornelia Josephine Mitchell, William Douglass Mitchell, Laura Mitchell, Charles J. Mitchell and Sarah Douglass Mitchell. She married William Barnes Wood, son of Green Wood and Evelina Alexander Barnes, on 24 November 1853 in Plantersville, Grimes County, Texas, second cousins; their maternal grandmothers, Jane Abercrombie Hall and Nancy Abercrombie Barnes, were sisters. Evelina Wood wrote on 14 May 1855, to her daughter Lizzie Powell, undergoing treatment for cancer in Murfreesboro, Tennessee: ". . . Billie came up this evening to read the letters and took them to Josie, he intends writing to Mr Powell by this mail. Lewis says all well at his place. . . ." Letter in private collection of B. M. Henwood, descendant of Wm Wood Powell; original transcription by R. E. Reichardt. On Wednesday, 4 July 1855, Green Wood recorded in his plantation daily account book: "Billy and wife started to Galveston to Meet Mr. Powell and Lizzie, with two carriages and drivers." And on Monday, the 9th, "Billy, wife and all returned this evening with Mr. Powell and Lizzie and child and nurse, got home this evening." On Tuesday, 13 December 1859, Green Wood recorded in his plantation daily account book: "Wm B. W's Son Mitchell died this evening, Flux." William Barnes Wood and Cornelia Josephine Mitchell appeared in the US federal census of 1 June 1860 in Montgomery County, Texas. Other members of the household included Evelina Wood, Robert Micajah Powell and William Wood Powell. Robert M. Powell was the widower of William Barnes' sister Elizabeth Green Wood. On Wednesday, 27 June 1860, Green Wood recorded in his plantation daily account book: "Mrs. Wood, Mr. Powell, Ella and Wood Powell and Wm B. W. and wife and daughter all left for Sour Lake." And on Monday, 1 July, "Bob returned from Sour Lake with the Waggon and six mules, left all well." On Monday, 9 July, "Started Bob with waggon and six mules to Sour Lake to bring the Bagage." And on Sunday, 15 July, "Mrs. Wood, Mr. Powell and the rest returned from Sour Lake. Mr. A. W. Speight and Lady came also. Cold Springs, Aug 30th /61. William Barnes Wood and Cornelia Josephine Mitchell appeared in the US federal census of 1 June 1870 in Danville, Montgomery County, Texas. Other members of the household included Evelina Wood, Evelina Alexander Barnes, Campbell Wood, Ella Abercrombie Wood, Eliza Stocks Wood, Elizabeth Ames Wood and Powell Wood. William Barnes Wood and Cornelia Josephine Mitchell appeared in the US federal census of 1 June 1880 in Montgomery County, Texas. Other members of the household included Virginia A. Mitchell, Kinnie Mitchell and Jane L. Mitchell. It is educated guess that Jennie is Virginia Mitchell, daughter of Josie's brother James. And it is likely that "Kinnie" and Jane are children of brother Charles, born after the 1860 census. It is an educated guess that Charles Mitchell died of consumption after his discharge from the 5th Texas Infantry. Evelina Wood wrote from Willis, Texas, to her grandson Wood Powell in Christian County, Illinois on 12 April 1887, ". . . I came to town last Sunday - Billie, Josie and Lina's two oldest children with us. . . . Lina has been quite sick recently – was not well when I left – I passed last Friday with her. she has a beautiful place a nice but very small house. She keeps a cook & grown nurse. Her time is taken up with out doors work. She says she is determined to raise her meat this year & sell butter enough to pay for her sewing. She can’t bear house work. She is now raising bronze turkies. they are very much larger than the other kind. has sent on for Pekin ducks. Jim A. has been in the Alliance store in Willis the last 7 weeks. He gives the farm no attention whatever, goes home Saturday nights & returns Mondays. Josie keeps Josie Lee altogether and she is a deal of trouble. Her dear patient grand ma says she can not do without her. Billie has so little to do at home for the want of rain. He comes to Willis about three or four times per week. A great deal lovely weather & east wind but no rain. ground too hard to finish planting cotton, garden almost at a stand still – Billie sets out cabbage plants by watering the ground so as to pull them up & water the ground to set them out. 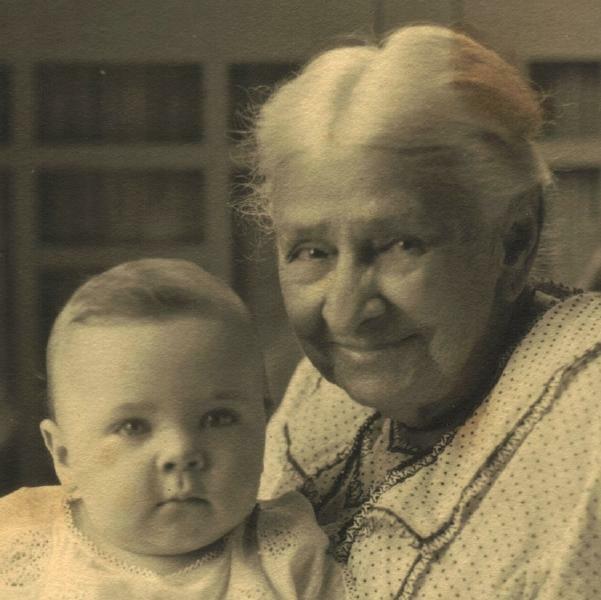 His corn looks green & pretty but almost quit growing. . . ."
Evelina Wood wrote from Willis, Texas, to her grandson Wood Powell in Christian County, Illinois on 12 April 1887, ". . . Ella is assisting Mrs. Woolridge in preparing for Maud's wedding (the only daughter) She marries on the 14, next Thursday night. A Mr. Watson who stands well in Willis. he is a dry goods clerk in T. W. Smith's store. Ella assisted in making ten large cakes yesterday & they are finishing them this morning. Ella’s afternoon will be devoted to icing & embossing them. she had several cakes baked here & will prepare some of the meats in her kitchen. Mrs. W. knows very little about such things. . . . Billie & Josie will be in to the wedding. Dr. W. lives across the street from us. I expect to witness the ceremony. . . ."
Letter in private collection of B. M. Henwood, descendant of Wm Wood Powell; original transcription by R. E. Reichardt. Minimal punctuation added to enhance readability. William Barnes Wood and Cornelia Josephine Mitchell appeared in the US federal census of 1 June 1900 in Montgomery County, Texas. Josie also was enumerated in the household of her daughter Lina Abercrombie in Huntsville. James Buford Abercrombie and Evelina Wood appeared in the US federal census of 1 June 1900 in Huntsville, Walker County, Texas. Other members of the household included Cornelia Josephine Mitchell, William Adair Abercrombie, Ella A. Abercrombie, Bolling Anderson Abercrombie, James Smither Abercrombie, Anne Mitchell Abercrombie, Robert Haden Abercrombie, Lavinia E. Abercrombie, John Leonard Abercrombie and Charles Milo Abercrombie. James and son Bolling also were enumerated in Falls County at the prison. Josie Mitchell Wood also was enumerated with her husband in Montgomery County. James Smither Abercrombie appeared in the US federal census of 1 January 1920 in Houston, Harris County, Texas. Other members of the household included Cornelia Josephine Mitchell, Anne Mitchell Abercrombie, Bolling Anderson Abercrombie, Charles Milo Abercrombie, Joseph Rice Abercrombie, Lavinia E. Abercrombie and James M. Calloway. Anne Mitchell Abercrombie appeared in the US federal census of 1 April 1930 in Houston, Harris County, Texas, at 3402 Audubon. Other members of the household included Cornelia Josephine Mitchell, Robert Haden Abercrombie and Hallie Ernestine Williams. Also in the household was Josie's companion, widow Hassie Camp. Cornelia Josephine Mitchell died on 28 September 1930 at age 95 in Houston, Harris County, Texas, at 3402 Audubon at her residence. . Her death was officially witnessed by Anne Mitchell Abercrombie. She was interred at Oakwood Cemetery, Huntsville, Walker County, Texas, in the J. B. Abercrombie lot. The following appeared on 29 September 1930 in a Houston newspaper: Funeral services for Mrs. Cornelia Josephine Wood, 95, who died at the home of her granddaughter, Miss Annie Abercrombie, of 3402 Audubon Place, at 4:40 a. m. Monday, will be held at the home at 1 p. m. Tuesday. /P/ The Rev. J. N. R. Score, pastor of St. Pau'ls Methodist Church will officiate at the services. Immediately after the services, the body will be taken overland by the Settegast-Kopf company to Huntsville for burial. /P/ Born in Montgomery, Ala., Mrs. Wood moved to Texas when she was a small girl and spent most of her life in Montgomery County and in Houston. /P/ Surviving are seven grandsons: W. A., B. A., J. S., R. H., J. L., C. M., and J.R. Abercrombie, and two granddaughters, Miss Annie Abercrombie of Houston and Mrs. Max B. Rothholz, of Luling, Texas; seven great grandchildren and three nieces, Mrs. J. V. Lee, Mrs. L. D. Langham and Mrs. Annie J. Smith.